Creating electrical plan with free templates and examples. Electrical plan has never been easier. Electrical plan can enhance user satisfaction and security if used appropriately. The electrical plan includes building electrification, lighting, telecom systems, data communications, security systems, and process electrification. The different ways buildings are used plus their quality objectives make a big difference to their electrical design. Particularly for specialized buildings, the input data meeting with the users are an essential part of electrical design in order to attain a successful plan. With Edraw software, you can easily draw an excellent electrical and telecom plan by choosing the most similar template and then modifying it. In Edraw, you can find exhaustive ready-made symbols of appliances and furniture, which easily help to build a professional-looking Electrical and Telecom Plan diagram. It offers the easiest way of drawing especially for average users. 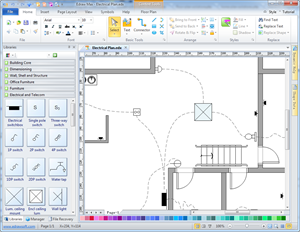 The advance features such as drag and drop function and automatic formatting makes your drawing incredibly easy. The drawing can be printed, shared on line or exported to PDF and other graphic formats with a single click. 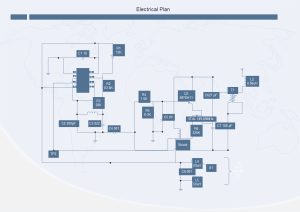 An electrical plan template is ready to use in vector format for your own designs.